Amazon Glacier is a Low Cost Storage Service for Archival Purpose newly has been introduced by Amazon and pricing is on Pay as You Go model like the others. Amazon Glacier is for mass data storage with low configuration hardware behind and is not intended for serving files using GET request, unlike CDN. Amazon Glacier is probably more better if you have very volume of storage need as a backup service. What is Amazon Glacier ? Amazon Glacier is designed with the expectation that retrievals are infrequent and unusual, and data will be stored for extended periods of time. This is officially written by Amazon. Retrieval up to 5% of data stored in Amazon Glacier goes for free each month. With $0.01 per gigabyte per month charge, Amazon Glacier saves the files as single or multiple archives. So unlike other backup services, it is not possible to use it for multiple purposes which is frequently done by the users. Amazon is using 256-bit Advanced Encryption Standard (AES-256) for encryption of the stored data. Amazon Glacier is actually not suitable for an average computer user. It is intended for small business to enterprise and Governmental data storage who basically seeks an encrypted data storage service for higher volume of data. The individual archival limit of a maximum size of 40 terabytes and 1,000 vaults per account simply explains it is designed in a different way. Amazon Glacier has support for API and SDK. Data retrieval system is dependent on REST API and should be setup as a job. Vaults are mean-ed for organization of data and archive is stored in a vault. 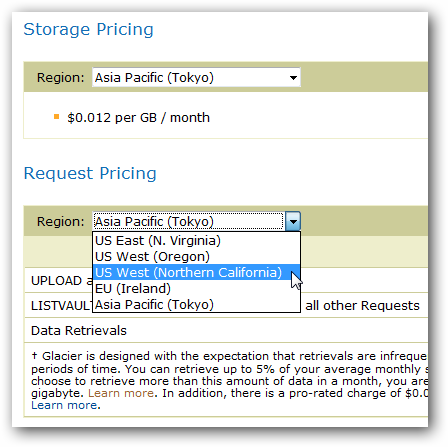 Currently, Amazon Glacier is offering 5 regions for data storage, 3 are in US (North Virginia, Northern California and Oregon) 1 in European region (Ireland) and the last one in Asia Pacific (Tokyo). This Article Has Been Shared 1569 Times! Dell Cloud Computing and Server Hardware are both present and future aspects of the brand. Dell is third in x86 server sales, behind IBM and HP. I mean, I don’t want to tell you how to run your blog, however suppose you added a title to maybe grab people’s attention? I mean Amazon Glacier : Low Cost Storage Service for Archival Purpose is a little boring. You ought to glance at Yahoo’s front page and see how they create article titles to grab viewers interested. You might add a video or a related pic or two to get people excited about everything’ve written. Cite this article as: Abhishek Ghosh, "Amazon Glacier : Low Cost Storage Service for Archival Purpose," in The Customize Windows, August 25, 2012, April 25, 2019, https://thecustomizewindows.com/2012/08/amazon-glacier-low-cost-storage-service-for-archival-purpose/.